Where can I download Identakid VM? 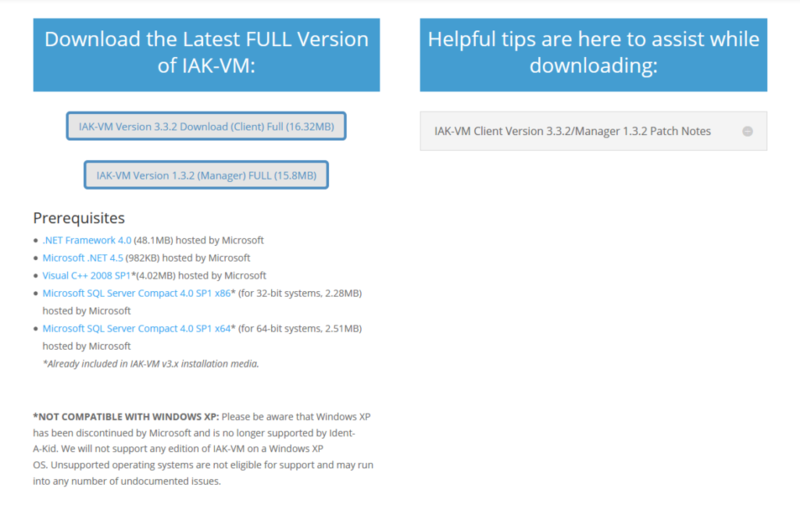 What are the system requirements for Identakid VM? How do I install the Client? Manager? Are there any prerequisites? Can I install the Client and Manager on different computers? You can download Identakid VM from https://identakid.com/3/. *Ensure you are installing the software from an account with full administrative rights, preferably a local admin. If the rights aren’t sufficient, it could cause errors with our program accessing the required libraries from it’s prerequisites and accessing it’s own database. Navigate to the V3 download page (https://identakid.com/3/). Once there, you will see 2 downloads, Client FULL and Manager FULL. Note: The below screenshot may have old versions listed. The latest version will always be available on our website. The Client and Manager do not need to be installed on the same system but there is a limit on how many can be registered at any one time. You can have up to 3 Managers and 5 Clients registered and running at once.